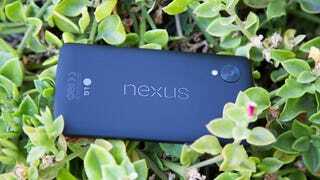 Did you bust your Nexus 5 smartphone? Don't sweat it—users are saying that the Play Store will send you a brand-new (refurbished) handset for free, no matter how you broke yours. Google hasn't confirmed the offer just yet, but it seems legit. This isn't the first no-questions-asked smartphone replacement policy; Motorola and HTC both offer free replacements for certain damaged phones. And it's likely that Google's offer is a way to clear out the company's stockpile of Nexus 5s, a device which has been on the market for nearly a year. Update: U.S.-based commenters confirm this offer is indeed valid. It's U.S.-only (sorry, rest of the world), and Google will charge the full value of the replacement phone to your credit card, but refund the money once they've received your old busted phone. And commenters point out that not every customer service rep immediately knows about the offer, but they approve the replacement deal as a "one-time service to valued customers." So uh, try to sound valued when you call. Update 2: We reached out to Google to confirm that this offer is legit. It is! But Google's calling it a "special exception," one that's only available in the U.S. at this time.